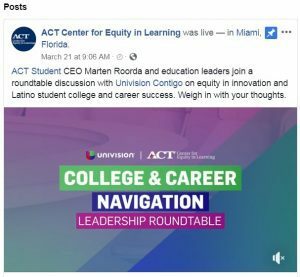 On March 21, ACT’s Center for Equity in Learning—in collaboration with our partners at Univision Contigo—convened a group of 100 education leaders and funders from across the United States in Miami for a College and Career Navigation leadership roundtable. 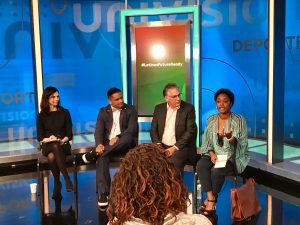 Discussion centered around topics including education equity in innovation and closing the digital divide, leveraging social and emotional learning to improve school climate, and working learners. The first panel, Equity in Innovation and the Digital Divide, was live streamed via Facebook Live. ACT CEO Marten Roorda, along with Daniel Gohl, chief academic officer of Broward County Public Schools; Nancy Lewin, executive director of the Association of Latino Administrators and Superintendents (ALAS); and Carlos Moreno, CEO of Big Picture Learning dissected the many facets of the digital divide and its effects on Latino students. They also examined potential solutions that pointed to initiatives extending beyond the walls of the classroom and that engaged education leaders in partnership with business and civic leaders. The digital divide is not just an educator or school district problem. In fact, Nancy Lewin described it as a global problem that requires bringing together community leaders, organizations, businesses, parents, education leaders, and the broader education community to make an impact. Marten Roorda emphasized that confronting the digital divide as a collective, and ensuring equity in innovation, needs to take more of an entrepreneurial approach. He encouraged school districts to work with their local community and businesses to find creative solutions. Beyond the sheer opportunity of technology, it’s critical to ensure that students are using technology intentionally and creating a knowledge economy, giving them a way to express and find their voice—to make sure students are not only consuming learning through technology but creating it too. View the full panel discussion on the ACT Center for Equity in Learning Facebook page. The next panel, Social Emotional Learning (SEL) – Diversity and Equity in the School Climate, featured Jim Larimore, chief officer for the ACT Center for Equity in Learning; Roberto Rivera, chief empowerment officer at 7 Mindsets; and Dr. Maurice Swinney, chief equity officer for Chicago Public Schools. The panel started with defining SEL as “what it means to be human, the talent and skills people need to thrive.” Examples included problem solving, critical thinking skills, self-management, self-awareness, and responsible decision making. Rivera highlighted examples of social emotional competence—social awareness and doing the right thing—such as young people helping their parents or elders bridge language barriers in unfamiliar or potentially stressful situations. Swinney addressed the school climate, urging educators to be respecting and understanding instead of telling and assigning. Schools should be organized around the needs of the students, and students need to feel welcome and wanted at their school in order to fully engage in the educational experience. Schools today are multicultural and multilingual. How we treat students and make them feel at school impacts their entire learning experience. The final sessions of the day brought to light many of the same themes and recommendations. Working Learners were discussed by Gretchen Guffy, state and federal policy senior director at ACT; John Pryor, principal of Pryor Education Insights; Dr. Jose Enriquez, CEO and founder of Latinos in Action; and Lucretia Murphy, senior director at Jobs for the Future. 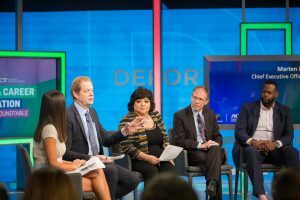 Moving People from Education to the Workforce was the topic for Michael Ramirez, HS cadre director at Broward County Schools; Melissa Agudelo, principal at San Diego MET High School; and Angelique Sina, president of Friends of Puerto Rico Foundation. A key takeaway from both groups was that as a community we need to make sure our young people have exposure and access to different opportunities. Adult mentors and parents can be the best advocates, which highlights the importance of outreach and engagement of parents from diverse backgrounds. Panelists also encouraged educators not to underestimate the importance of sharing their own personal story, which helps students recognize educators as people who care about them, and whose personal insights and experience can provide them with information that is relevant to their own life journeys. Students need help to navigate, or de-code, the unwritten rules of work culture. For example, a casual workplace may not necessarily mean it is acceptable to wear jeans, even on Fridays. Relationships are vitally important in schools, communities, nonprofits, and businesses. Students might not realize that language used in resumes is vitally important. It’s important to teach students how to demonstrate their strong 21st century skills. Even if working learners aren’t working in a job that is a precursor to a future career, they are still likely gaining transferrable skills to add to their repertoires. For instance, fast food employees gain valuable conflict management experience, and housekeepers have strong attention to detail and the ability to work autonomously. Educators can help students see and articulate these connections. Participants left the event with new connections along with renewed purpose and energy to continue making sure opportunity, access, and inclusion is provided and available to all students.